Overview... a young warrior seeking revenge for the deaths of his parents. Conan is determined to track down the Snake Cult and its leader Thulsa Doom, and will kill anyone who gets in his way. Personality… brawny, brutal, and mad as hell. He has the ingenuity required of a warrior, although he has nothing resembling an education. While he is extremely vengeful, and claims that there is no higher pleasure in life than “Crushing your enemy, seeing him driven before you, and hearing the lamentation of their women,” he isn’t a complete monster. Conan does possess a rudimentary sense of honor, and tends to repay loyalty in kind. Still, the barbarian is a committed cynic, who understands that in a world as dangerous as Hyboria, the only thing you can truly rely on is the strength of your sword-arm. Conan's popularity ranking on CharacTour is #2001 out of 5,000+ characters. See our top-ranked characters and read their profiles. 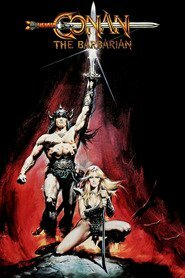 John Milius's jingoistic direction and pulpy screenplay fit perfectly into this film version of the Robert E. Howard fantasy story of the sword and sorcery hero, Conan the Barbarian. The story begins when a horde of rampaging warriors massacre the parents of young Conan and enslave the young child for years on The Wheel of Pain. As the sole survivor of the childhood massacre, Conan is released from slavery and taught the ancient arts of fighting. 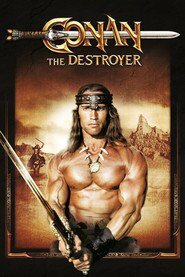 Transforming himself into a killing machine, Conan travels into the wilderness to seek vengeance on Thulsa Doom (James Earl Jones), the man responsible for killing his family. In the wilderness, Conan takes up with the thieves Valeria (Sandahl Bergman) and Subotai (Gerry Lopez). The group comes upon King Osric (Max Von Sydow), who wants the trio of warriors to help rescue his daughter who has joined Doom in the hills.